Vroom! is a fantastic game developed by Impromptu Games with the UDK and one that is actually free to download on PC (there’s also an iOS version). This game is based on their Half-Life 2 mod Shotgun Sunrise and features three tracks and an easy to play, hard to master gameplay that will get you laughing as you smash zombie after zombie with your truck. It’s not just zombie flattening either – you have to race around the track to keep seconds on the clock. 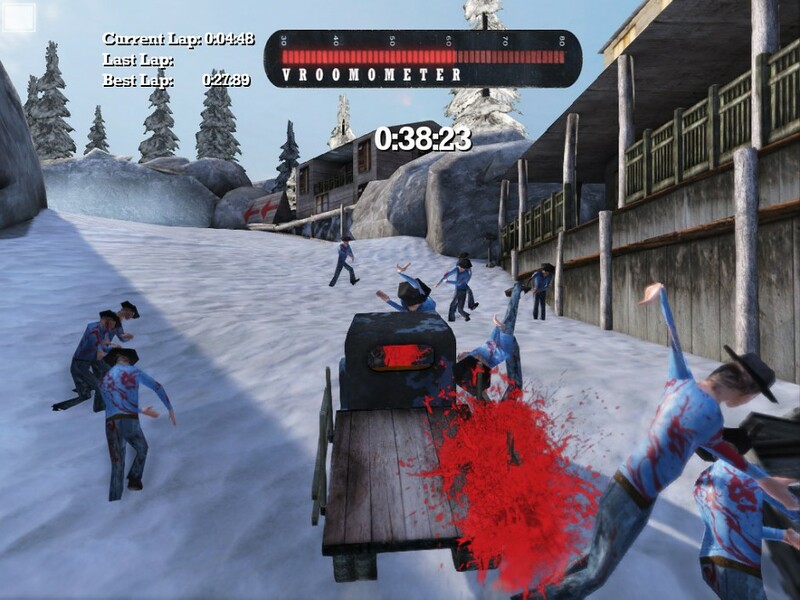 The more zombies you smash, the more seconds you gain and in the end you can try to beat your best lap and the number of zombies that you smashed. You can play in first or third perspective, but the later is probably better since it gives you a better view of the surroundings (although first-person perspective is more immersive and downright funny). Physics are somewhat floaty, over-the-top, but not in a bad way – the truck isn’t exactly easy to control, but this seems like a deliberate choice of the developers to add to the craziness of the game and not a consequence of bad design. Vroom! looks great, plays really nicely and is a great way to kill fifteen minutes now and then.